By now, you’ve figured out that I love a bargain. It’s what this whole blog is about. 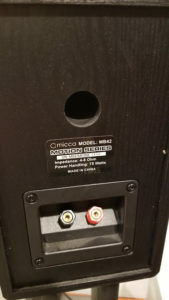 There are always several speakers that come up in conversation when people talk about the best bargain in speakers. One model in particular that gets dropped a lot is the Micca MB-42, and its successor, the MB42X. Never heard of them? Don’t feel bad, I hadn’t either. They are an Amazon product almost exclusively, though do seem do be available through a few other online retailers. Originally, they were simply the MB-42, a model with a capacitor and no crossover (the “X” designation in later models indicate the addition of a crossover) which sold for the amazingly low price of just $60. Yet, here were so many people giving them rave reviews and recommending them on audiophile pages on Facebook. It had me curious. I suppose they might have remained a simple curiosity forever, had I not happened upon a pair for sale locally on OfferUp for 30 bucks, in mint condition. For that price, it was worth it to find out what out what all the fuss was really about. 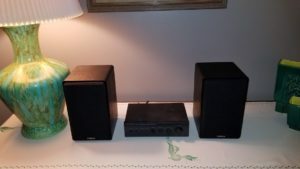 I hooked them up into my two channel system at first, figuring a speaker like this would benefit from a subwoofer. 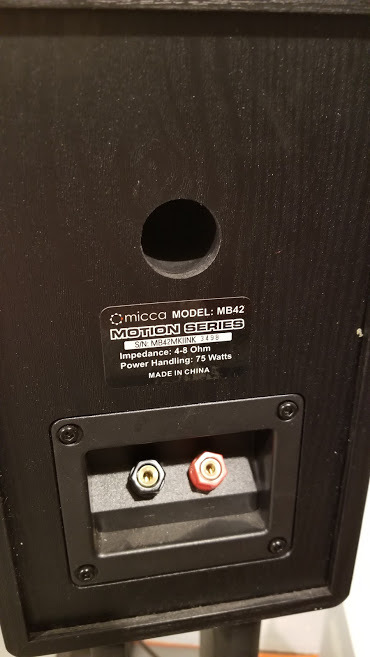 Crossed at 80hz, the Canton sub would take of what the Micca’s 4” might not be able to do. At least, that was my initial assumption. My first test was Pink Floyd’s “Shine On You Crazy Diamond.” First impressions were good, but did not last long. The MB42’s gave a nice sense of space that made them seem like a bigger, more expensive speaker for the first couple minutes of the song. David Gilmour’s guitar had a decent presence. Not stellar, but I wasn’t expecting the world here. Once the rest of the instrument kicked, however, the shortcomings of these speakers began to come through. The upper mids have a certain harshness to them. That presence becomes an almost unlistenable brightness at times. Once the sax came in towards the end of the song, it sounded thin and frail. 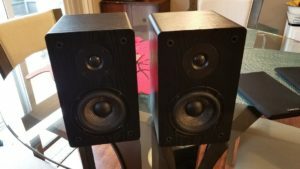 A test of another couple of discs of music only made me like these speakers even less. Unfortunately, they have not mellowed. They are still a harsh little speaker. To be honest, as I’m writing this, I’m beginning to develop some real listener fatigue. I’m going to bring the volume down and finish my review. Robert Plant’s “Now and Zen” album, a well-produced record, is just downright painful. Switching over to Blue Tofu, one of my go-to test discs, does produce some interesting results. At least I no longer want to claw the stuffing out of my listening chair. 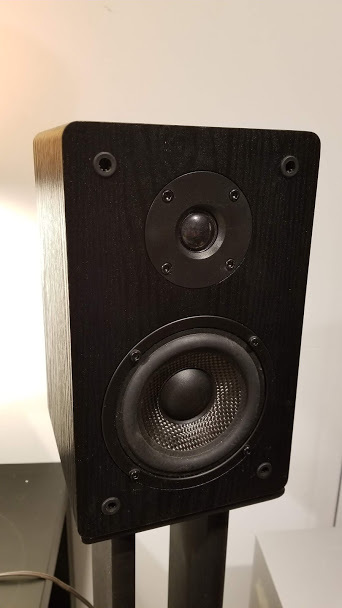 The Miccas do give some nice low end for being such a tiny (and inexpensive) speaker. The imaging is better than I would expect from something at this price point, but sometimes they almost seem strangely out-of-phase. I actually got up and double-checked my connections to make sure I had all my reds to reds and blacks to blacks. So, I guess I will say that the imaging strays into artificial at times. The bottom line is that these are definitely not an audiophile speaker, as much as people would love to find this kind of bargain. They simply miss the mark in too many places. They certainly have their high points, but not enough to outweigh the harshness, listener fatigue, and odd imaging. These are sort of the sonic equivalent of your buddies recommending that you stop at White Castle on the way home from the bar. It won’t cost you much, it’s fun, but you’re probably going to regret it. I just don’t get what all the fuss is about. Interestingly enough, a little lightbulb went off over my head and I ended up finding a great use for these speakers after all. No, it didn’t involve kerosene and a YouTube video. For several years now, under my work bench, lurked this little Radio Shack amplifier. I picked it up somewhere, and just haven’t known what to do with it, but like all audio pack rats, I’ve kept everything, knowing somehow, somewhere, I’ll have some amazing use for it. (I believe I’ve previously spoken about my wife’s undying patience.) It’s a handy little piece of gear, but always sounded kind of dull and lifeless. What if I paired this little Optimus amp and Miccas? (Cue: evil laugh) What could go wrong? It turns out that my IPA-fueled hunch was absolutely on the money. The marriage was so strong between them that they demanded a clever Hollywood nickname like Optimicca now. With my iPod as the source, I now had the perfect little traveling system. It all fits in an old L.L. Bean backpack from my wife’s college days and beats the snot out of a Bluetooth speaker. More on this whole thing to come!